Only a short drive from Portland, this country inn provides refined, friendly lodging and activities in a superb setting near Winslow Homer's studio. The 3-star, 25-room Black Point Inn on Prouts Neck just southwest of Portland, Maine (map), is among the best places to stay in New England. Set on a hill overlooking the sea in a realm of private estates, a country club and a yacht club, the inn is relatively small, with refined ambience and a sense of personal service. Prouts Neck, a small peninsula jutting south into Saco Bay, is only 10 miles (16 km) south of Portland, but is a hundred miles away in terms of mood and tranquillity. The ambience is pure, traditional New England country inn, with refined traditional decor. The living room, with large sea-view windows, has comfortable classic furniture, a large fireplace, a grandfather clock, and quiet classical music in the background. 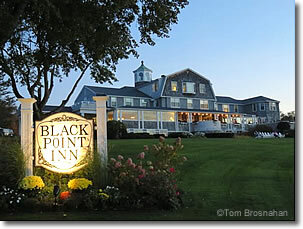 Guest rooms at the Black Point Inn have ocean, bay or swimming pool views, supremely plush, comfortable beds, individual climate control, and all amenities. Room rates vary depending on room size, views and furnishings. In lieu of tipping, a service charge is added to the rate. The seasonal heated swimming pool, tennis courts, fitness room, bicycles, kayaks, fishing gear, yoga classes, a private beach club, and golf privileges at the nearby Prouts Neck Country Club fill guests' time here. 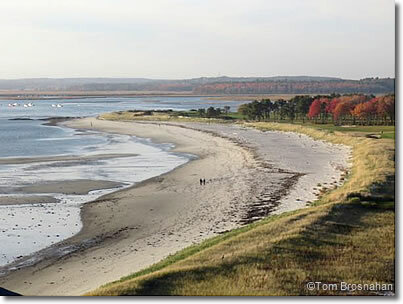 The Western Beach on Saco Bay is just across the road from the inn, and Scarborough Beach State Park is only a mile (1.6 km) away. Cliff Walk, a footpath that meanders along the shore and cliffs of Prouts Neck, is a favorite walk starting right outside the Inn. Famed American painter Winslow Homer's studio, now administered by the Portland Museum of Art, is also on Prout's Neck just a short walk from the inn. The Point Restaurant offers fine dining in the evening, and the less-formal Chart Room provides breakfast, lunch, snacks and a bar with seating indoors and on the porch outdoors with fine views of the Western Beach. What makes the difference at the Black Point Inn is the welcome and the service: supremely helpful, friendly, knowledgeable local staff and direct family management. You'll feel at home here.